Shake the rack to watch and listen as the balls move inside, or pull all ten out to roll them across the floor. When stacked inside the cage, in any order, the vibrant spheres allow the newly constructed car to drive in any direction. Children can push it straight, pull it back, move it from side to side, or give it a shove to watch it glide across any surface. When it's moving, each ball will spin to create a colorful show, and when it's stationary, they can rattle back and forth for auditory enjoyment. Like a building set and toy car in one, children are required to stack and pile the balls inside the rack to create a brightly colored vehicle. Once they have it built, the spheres remain securely in place, so they can drive all over the house without any worry or frustration. Ideal for small children to use as an assistant while crawling, but also great for older kids too. Help them improve fine motor skills, and hand-eye coordination while their imagination runs wild because this simple toy offers plenty of room for them to explore and be creative. Young ones will challenge themselves to collect every sphere and place them inside, while older ones will stack and re-stack as they learn about colors and spacial relationships while building and observing the twisting shapes. 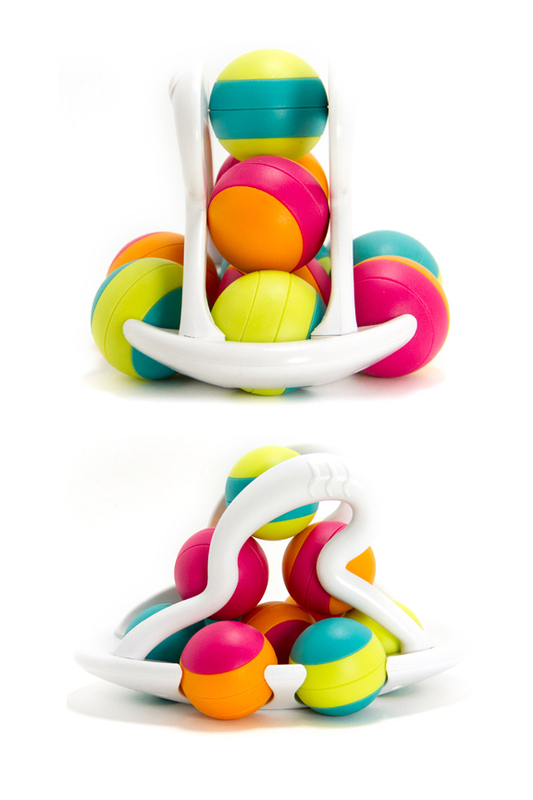 Originally inspired by the universal love that children have for billiard racks full of balls, your kids will enjoy collecting the multi-colored spheres in order to stack and arrange them inside the cool looking cage. Once each ball is inserted, they remain inside, without rolling out, and the vehicle created can move in any direction easily. They can still shake it back and forth like they do when your trying to play pool, but they also gain the fun familiarity of a toy car as well. It's ideal for crawlers that stay close to the ground, but it's also fun for toddlers and older children too. 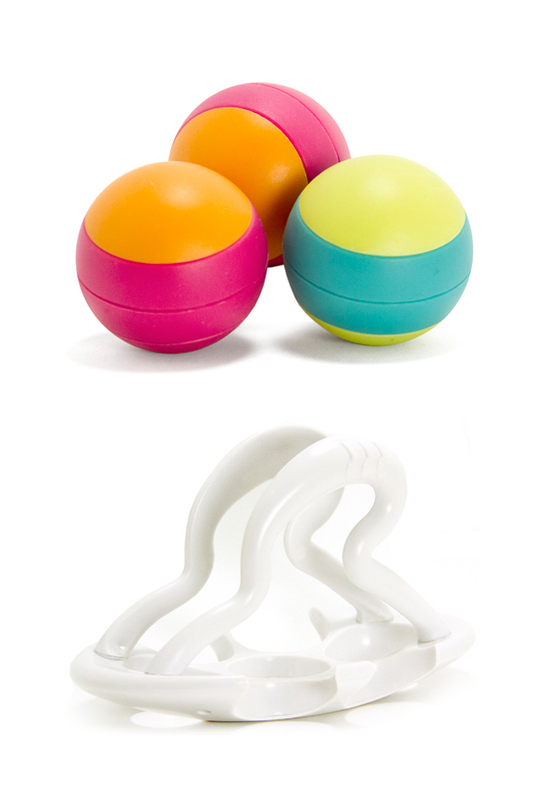 Use with only a few balls, or pile in all ten and watch the colorful rolling action. The bottom balls will act as the wheels, and as you drive it forward, those balls will spin one way, the balls above will spin the opposite way, and the ball on top of them will spin the same way as the wheels. The colorful action is hard to resist. Multiple Directions Yes - Roll in all directions. Uses Stack the balls to arrange in differnet configurations, then push or pull to roll in any direction. Grab the cage to shake back and forth, or push along the ground to go vroom vroom like their favorite car. Parts Included One white rack, and ten colorful spheres. 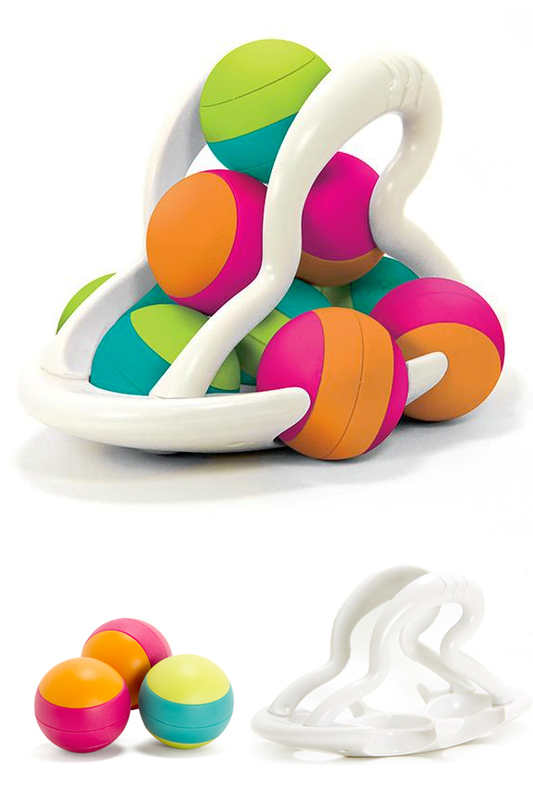 A colorful car, rolling balls and stacking toy in one. Little hands can easily fill the cage to make a vibrant vehicle, then push or pull to glide it across any surface. Order Yours Today! My grandson--about a 1 1/2 year old--really likes it. That said, it takes a child with some perseverance and focus to enjoy playing with it. I am surprised that my grandson is patient and spends the time to make it work So I think not every child will enjoy it. I am not sure my other grandson, about the same age, would enjoy it, especially as his mother would not have the patience to collect the balls and put them in place time after time. This very colorful push toy is easy for infants to play with and as they age, it becomes helpful for eye-hand coordination. I like it.